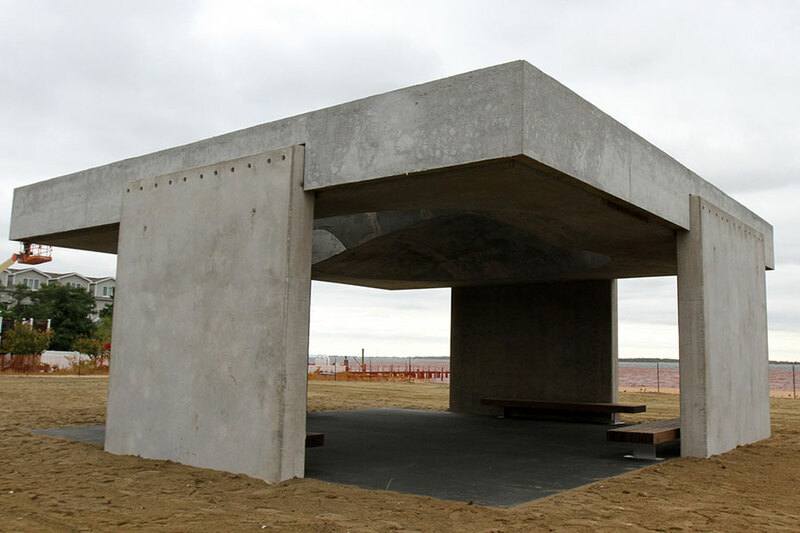 The Williams + Tsien-designed concrete pavilion is not complete yet, and sits alone on the New Jersey beach as a threatened monument to resilience. It if comes down this year, it would be one of the shortest-lived buildings in American history not intentionally built to be temporary. This is the third endangered building in three years for Tod Williams Billie Tsien Architects, which saw its American Folk Art Museum taken down in 2014, just 13 years after it opened. Johns Hopkins University confirmed last year that it is exploring the possibility of demolishing all or part of the Mattin Center, a three-building arts complex completed in 2001, and is raising funds for the replacement. This time the structure in question is a beach pavilion in Highlands, New Jersey, which opened last fall and is dedicated to the survivors of Hurricane Sandy. Made of resilient concrete with openings in the roof to serve as skylights, it was erected on the site of a less sturdy metal gazebo that was destroyed by Sandy in 2012. It is so new that the architects never even had professional photographs taken because they were waiting for some finishing touches. It is also not on the firm’s website. According to studio director Octavia Giovannini-Torelli, they still consider it unfinished. The 1,100-square-foot building weighs approximately 173 tons and was designed as a multipurpose shelter and gathering spot for the public. It was a gift to Highlands from the Tilt-Up Construction Association, a non-profit group based in Mount Vernon, Iowa. The organization had its annual convention last year in New Brunswick, New Jersey, and donated the pavilion to Highlands in conjunction with that meeting. Williams and Tsien designed it pro bono. The borough’s council officially accepted the gift before construction began and the borough issued permits for construction. The pavilion is now endangered because the state of New Jersey claimed the owner didn’t obtain a permit for construction from its Environmental Protection Department, which regulates construction close to the shoreline. As a result, the state says the owner either must apply now for the permit or take the building down. The permit application fee costs $3,000, and there’s no guarantee that the application will be approved. Besides the permit snafu, some residents say they don’t like the building. Opponents say it blocks views of the ocean from some houses and from the local community center, which survived Sandy. They’ve dubbed it “Shorehenge” and “beast on the beach.” They’ve created a Facebook page where they complain about it. On January 1, the Highlands Borough Council voted to ask the concrete organization to take the building down. The concrete organization said it is a nonprofit that doesn’t have the money or the contractor license to do so. The trade group said the construction work was donated by a consortium of regional companies, headed by Alston Construction, and that the borough is now the rightful owner. Bloomquist said this sort of dispute has never come up with one of its projects before. He said the group, which turns 30 this year, typically seeks to work with a local community on a project that will improve it in some way, whether it is a permanent structure or an event at a local college. He said he asked Williams and Tsien to design the pavilion because he was familiar with their work and their “concern for the community,” and he was delighted when they agreed.